Design Therapy: Change Is Good! So it's official! We're finally finished with DIFFA'S Dining By Design and we couldn't be more thrilled with the experience as well as the overwhelming support from everyone involved who either made a donation or stopped by over the weekend to check out this incredible event. We apologize for being off the radar the past couple of weeks, but it took quite a bit of time and energy to put this together. However, in the end it was more than worth all the hard work and effort to get it done. We met some of the nicest, most talented designers who were also participating in DBD and we were truly amazed at their level of creativity and imagination. We started setting up last Wednesday with essentially an entire group of strangers, but by the time we broke everything down this morning, we felt like we had just returned from a weekend a way with good friends. Again, for those of you who may not be aware DIFFA (Design Industries Foundation Fighting AIDS) is one of the largest fundraisers benefiting HIV/AIDS service and education organizations in the United States and has provided more than $35 million to hundreds of these groups nationwide since it's inception. 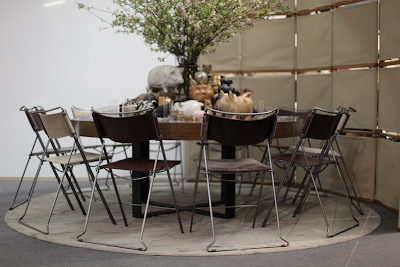 Dining By Design is DIFFA's signature fund-raising event and multicity marketing platform, where designer's are asked to create elaborate dining experiences to showcase their creativity. It also happens to be one of THE most fun events of the year! 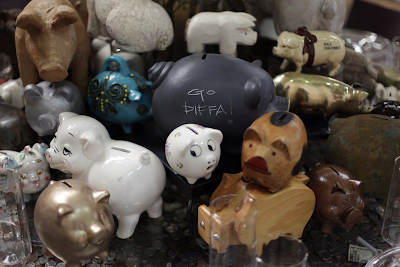 Considering the current economic climate, we wanted to create a dining environment that focused on helping DIFFA as much as possible throughout the 5 day event. 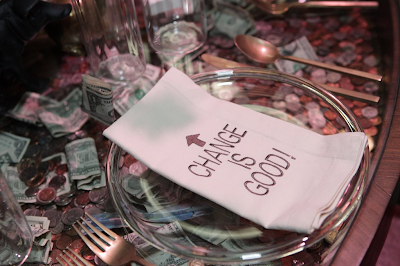 Even during difficult times almost everyone has some spare change in their pockets so we thought, why not create a dining table where people can actually deposit that change and help put the "fun" back in fund-raising. 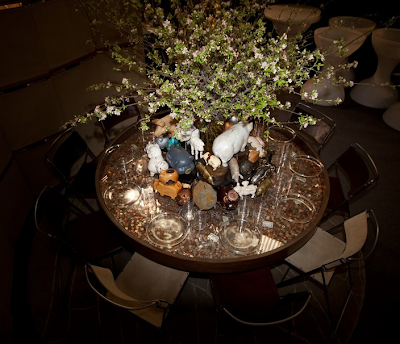 We designed our table almost like a shadow box with a lucite top that had "coin slots" at each place setting so that people could drop in a few coins, a dollar bill, a ten or a twenty. We figured a little change can add up and bring about big changes to those in need, especially during these tough economic times. 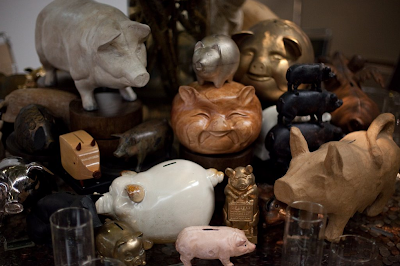 We then topped off the table with an array of vintage piggy banks just to drive home the message "Change is Good!" We were thrilled with not only the way the table turned out, but more importantly how many people actually "made deposits" throughout DBD. Apparently DIFFA was excited as well and asked us if they could take the table on their national tour. 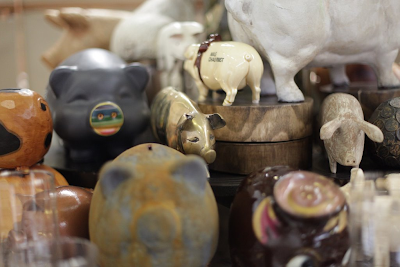 Of course we said yes, and this morning we said goodbye to all our little "piggies" and wished them a fond farewell as they embark on a 7 city tour, with stops in Kansas City, Chicago, Dallas, Atlanta, San Francisco and Los Angeles. 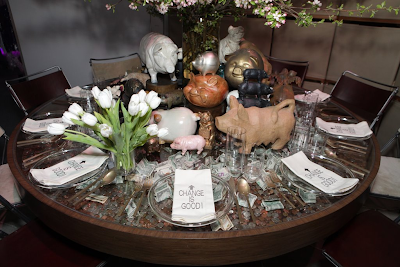 The New York Event officially ended last night with the big Gala Dinner, where people paid up to $1000 for a seat at one of these custom created dining tables. We had a terrific time celebrating with those who came out to show their support including everyone from Miss Universe Dayana Mendoza, to Whoopi Goldberg (who slipped a rather large bill into our table-bank) and our table mate, the high-larious journalist Michael Musto. All in all, there was quite a bit of money raised for DIFFA and we can't thank them enough for asking us to be a part of this year's event. 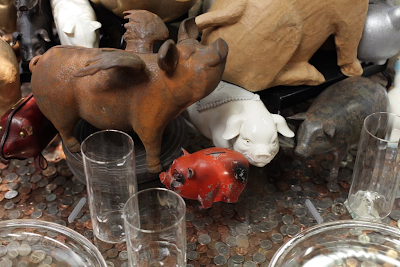 - BAMBOO AND LUCITE DINING TABLE TOP: SIEGFRIED’S BASEMENT INC.
- PIGGY BANKS: FRIENDS, FAMILY, AND EBAY! We also want to thank our friend Heather over at Habitually Chic for posting such a great piece on our table and the event. She's got some nice pictures of some of the other tables so make sure you click here to check it out. Congratulations! You must be very proud!!!!! Congratulation indeed!!! We could not be more thrilled to have this totally beautiful and meaningful table on the tour with us. Brad you are a light - shine on BABY! Amazing! You are crazy talented... Sounds like it was an awesome experience. A job well done! i am so sad to have missed this. Brad, you are so incredibly talented! I know it, but it is so nice to see the end result of your hard work! From a fellow Arkansan (and Razorback fan), I absolutely loved your table!!! I was thrilled to get to see it in person and excited that your napkins came from the copper pig where I have been many times! A job well done to you! It was really nice to have such sort of blog, which flow information exact the way visitor want. Waiting for your next post to live.